Birth of Eliza- A Birth Photographer's Birth - Denver and Colorado Springs Birth Videography — Love is Photography LLC. Monet is one of the generation's greatest birth photographers. I am so glad that I get to call her a friend. When I was just starting out in 2014, and she was in the beginning stages of making a name for herself, I had the pleasure of working alongside her for a few births while we both built our portfolios. Not long after, and before she and Ryan decided to start trying for their second baby, she talked of hiring me for when she did become pregnant. Fast forward about a year later, she became pregnant with little Eliza! Of course I was so ecstatic for her and Ryan and I was thrilled to be officially invited to capture her beautiful birth on film alongside the great Jennifer Mason. 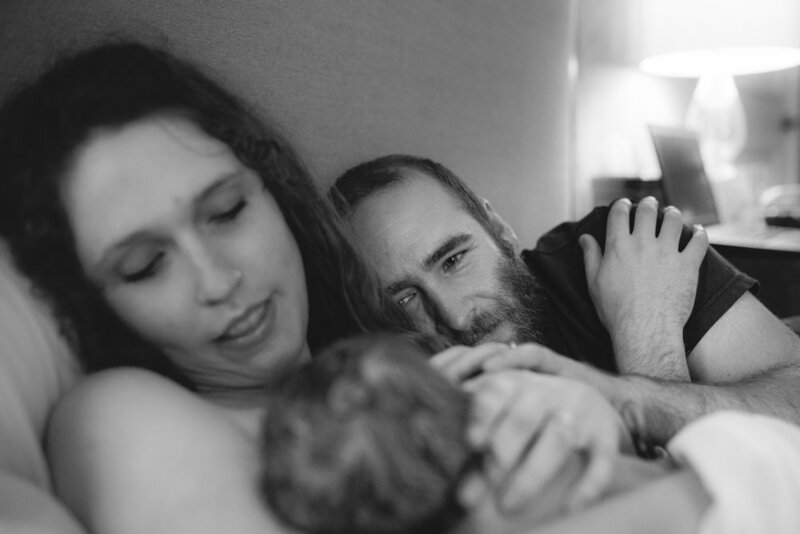 The pressure of Monet's birth prompted me to really hone in on my craft and practice as much as I could to ensure that I could tell this woman's birth story in a truly beautiful and professional way. After all, this lady sets the standard in the birth photography field like not many have before, I needed to make sure I could live up to the task. On top of that, I was going to work side by side with one of Denver's most well known birth photographers, who had been in the business much longer than I have; Jennifer Mason. As you can tell, I was very excited about it all, and I quickly got to work on my video skills. As the days approached, I only had 1 or 2 others due around the time Monet was due. All of them were to deliver 1-2 hours north of where I live in Colorado Springs. Monet kept telling me that she believed that when she went into labor that it would be very, very fast. This wasn't the best news, but I was determined to make sure that I was there. I feel like it was divine timing the morning that Monet went into labor, as I was already in Denver, just 35 minutes from the birth center where she was delivering. However, I was in Denver, at a hospital, photographing a budding birth photographers birth. It posed somewhat of a conflict, me being at another wonderful birth just as Monet's contractions were starting to pick up and she alerted me that she was going to start heading to the birth center. It seemed like I just might not make it, and not because of travel time. Around 8 or 830 am, Tiara birthed her first son into her arms. It was glorious, and the timing was perfect. I snapped some of those very first fresh moments for her, alerted her that I would need to leave immediately but that I would return later to capture some newborn images, and off I ran! I remember very vividly running down the halls of the hospital, to the elevators, only to be met with a road block. The elevators were temporarily out of service for a security reason I believe, and my heart was about to explode from the running, and now from the image I had forming in my mind of Monet giving birth to her beautiful baby girl, surrounded by everyone that was supposed to be there...except for me. The elevators did return to normal within about 10 minutes of waiting, and I couldn't have ran out of that hospital faster. As I sped down the highway, up to Wheatridge, I kept in contact with Jennifer and she assured me that she was in fact still pregnant. Phew! I got lost trying to find this cozy little birth center, tucked away in an plaza. But once I did find it, I did my best to get to her room quickly, and quietly. I got my camera set correctly, pulled it up, and got straight to work. Monet was in the shower when I arrived, laboring intensely with her husband and doula. She quickly moved to the tub after it was all filled up, and contractions began to get closer together. It was so beautiful and peaceful, watching her labor in the room that she had set her mind on, and in the daylight that she had dreamt of. Surrounded by everyone that was supposed to be there...including me. At some point she decided that she would feel more comfortable on the bed, and on that bed she birthed her sweet little Eliza. Her second precious daughter. Just as Eliza's head was born, Ryan's mother walked in the room. I can't even imagine the emotion that coursed through her body at that moment, but I am so very grateful I was there to film her reaction in that instance. Everything about her family, and her team was just amazing. The love that was felt in that room that day was immense. Thank you so much Monet and Ryan, and the whole team at Baby + Co that day. It was such a pleasure to be apart of such a wonderful day. I will never forget it.